If you’re pursuing your compTIA A+ Certification, you need to know about the hardware devices involved in setting up a network. One of the devices that might appear on the exams is a router. A router, which is responsible for sending information from one network to another, is an important network device because most companies are connected to the Internet. When a computer on your network wants to send information to a computer on another network, your computer passes the information to your router. 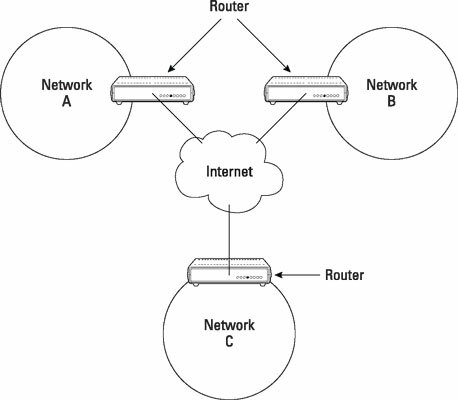 The figure shows three different networks, each connected to the Internet by a separate router. All computers on network A know that any information with an outside-network destination must be passed to the router because the router is the only device with a physical connection to the outside world. Routers send data from one network to another.